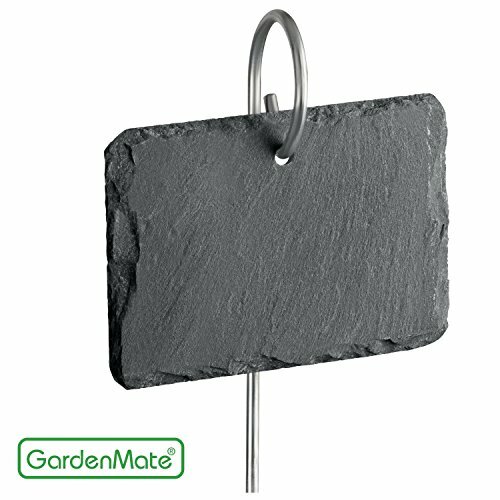 This aesthetically beautiful slate plant label on the stainless metal rod is the exclusive result of our product development. Romantic and original effect the chipped edges of the label. Each plant label is unique and shaped from its natural structure. The writing surface is 4" x 2 3/4" in size. So you have enough space for all your information. With a total height of about 22" it is an absolute eye-catcher in your garden between roses, perennials and herbs. Our tip: write your text with a normal lead pencil before (against light it can be seen very well) and then draw with the paint pen after. You can remove the paint pen with conventional lighter fluid and a lint-free cotton cloth. Metal rod about 22" long, slate tag 4" x 2 3/4"